For some people the idea of something being temporary is both upsetting and stressful. They want things to be permanent or in the very least, last for a very long time. 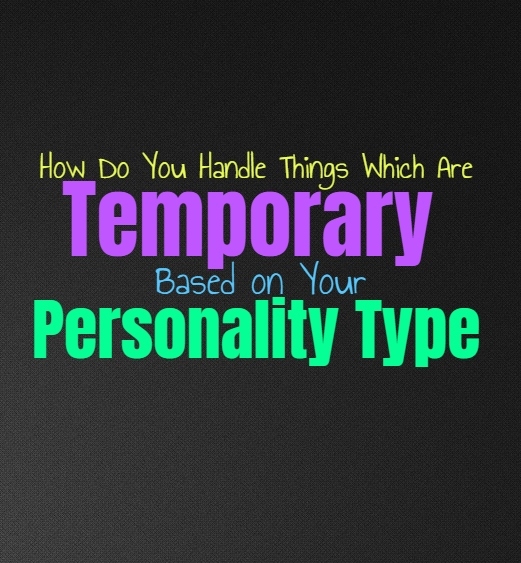 Here is how you handle things which are temporary, based on your personality type. INFJs can have mixed feelings about something being temporary, but they often find themselves conflicted about things in life. They can find beauty in the things which are fleeting, especially when those moments or connections hold a serious place in their hearts. They can certainly appreciate these temporary things, but at the same time they search for something more permanent. INFJs want to have things in their lives which are more steady and which they can hold onto for the long haul. ENFJs have a hard time with things which are temporary or fleeting, and often prefer something more long-term. They don’t like when someone is not meant to last and can hard time really saying goodbye or letting go. For the ENFJ it is important be able to make lasting connections and have things which they know will last. When something is temporary it leaves them realizing that they will have to let go, and this really isn’t something they enjoy. INFPs don’t mind when some things are temporary and can often find the beauty in this. They enjoy being open to change and will do their best to move onto something new. This doesn’t mean they won’t struggle to let go of something which was special to them, but they often hold it close to their heart after it is gone. INFPs can certainly appreciate the things in life which are fleeting, as long as those things hold a deep meaning for them and are not simply shallow. ENFPs don’t mind when something is fleeting, as long as it holds a sincere and powerful meaning to them. They are willing to move on when something changes, and do their best to keep moving forward. For the ENFP it is important not to feel held back by a fear of moving on, and so they try to be open and accepting when things change. They do like to have things shaken up a bit and can often appreciate something when it is gone. INTJs don’t really enjoy things with are temporary, since it doesn’t often hold much value for them. They want things which they can hold onto and don’t want to feel like they are wasting their time on something short lived. For the INTJ it is better to focus on building something sturdy and making connections which are going to last. Things which are fleeting don’t often serve the purpose they are looking for, especially if it doesn’t provide them with anything valuable. ENTJs are focused on making commitments and holding onto things which will last for a long time. For them the things which are temporary only mean they need to let go of something which might be important to them. ENTJs don’t really enjoy things which are fleeting, especially if they feel like they don’t get an opportunity to gain something from it or even learn from the experience in a valuable way. INTPs don’t mind things which are fleeting, especially if they can really learn from it. They want things they can feel inspired by, and sometimes the things which are temporary can provide this for them. INTPs want to be open to change and are often less satisfied when they are stagnant and unable to shake things up a bit. Sometimes the things which are temporary can hold a special place for the INTP, especially if they feel as if they have really walked away wiser because of it. ENTPs don’t mind when something is fleeting, especially if they feel like they have learned from it. They enjoy bouncing around and being able to dive into something new. For the ENTP having things which are constantly the same, is far worse than something which is only temporary. If this temporary things is exciting and fulfilling for them, then it is often worth the loss in the end. ENTPs simply want to be able to experience things which inspire them and which they can learn from. ISTJs really don’t favor things which are temporary, since they value commitment and holding onto things. When something is constantly changing or bouncing around it can actually be rather stressful for the ISTJ. They want to be able to have things in their life which will remain there for the long-term. When the ISTJ wants something or commits to something, they really don’t want to have to let go of this or move on. ESTJs aren’t fans of that which is temporary, instead they want more permanence in their lives. They value things which are sturdy and can stick with them for the long haul. ESTJs really don’t want things which are fleeting or will constantly lead to change in their lives. They enjoy having something which they know and trust, something which is reliable. For them having something temporary only leads to heartache and stress. ISFJs don’t really want things in their lives which will be temporary or fleeting. ISFJs want to have things be more permanent and enjoy that which they can rely on always. Knowing that something is just temporary can be painful for the ISFJ, especially when it comes to relationships and loved ones. Having to let go of something they love, is going to be deeply upsetting for the ISFJ. ESFJs really don’t like things which are temporary, instead they want more prominence. They care about things which are sturdy and reliable, not things which bounce around and are unpredictable. For the ESFJ things which are fleeting can cause them pain and force them to have to let go when they don’t want to. They want things they can trust, and prefer connections which are there for the long-term. ISTPs don’t mind when something is temporary, especially if it is exciting in the moment. They want things which are exciting and thrilling, even if it won’t last forever. They live in the present and go after the things they want, even if they know it might not last forever. ISTPs don’t expect to hold onto things forever, and can often except when something is bound to change in their lives. ESTPs don’t mind when certain things are temporary, since they live very much in the present moment. They can often accept when things will change a bit, since they are open to moving forward and letting go when they have to. ESTPs want to seek out things which inspire and excite them, even if these things might not last forever. For them it is about going for what is exciting in the moment, not what will last long-term. ISFPs don’t mind when something is temporary, as long as it is fulfilling in the moment. They want to seek out things which inspire and excite them, even if those things are going to be fleeting. While there are certain connections the ISFP wants to last long-term, that doesn’t mean they won’t still enjoy the experience while it lasts for them. They live in the present and don’t want to become too caught up in calculating everything in their future. ESFPs do want certain things which they can hold onto in their lives, but at the same time they understand that some things are temporary. When they are excited by something they often dive in without really thinking about how permanent this will be. ESFPs want to live in the present and seek out whatever makes them happy and excites them. While some of these experiences might be temporary, it still holds a special place for the ESFP.